Creativity and imagination are important skills to work on in childhood just like learning to crawl and communicate. A lot of people think that creativity is a gift, but I truly think creativity is something that can be practiced and developed. Imagination is also becoming more of a lost skill as kids are sitting in front of TVs that provide all the imagination they think that they need rather than creating the stories themselves. Today I wanted to help Noah explore his creative side. When I think of Noah’s future I hope that there are no limits for him, but I also sometimes worry about what his future holds. I figure that the arts are a way for him to express himself without limits whether it be painting, drama, music, cooking, taking pictures, etc. 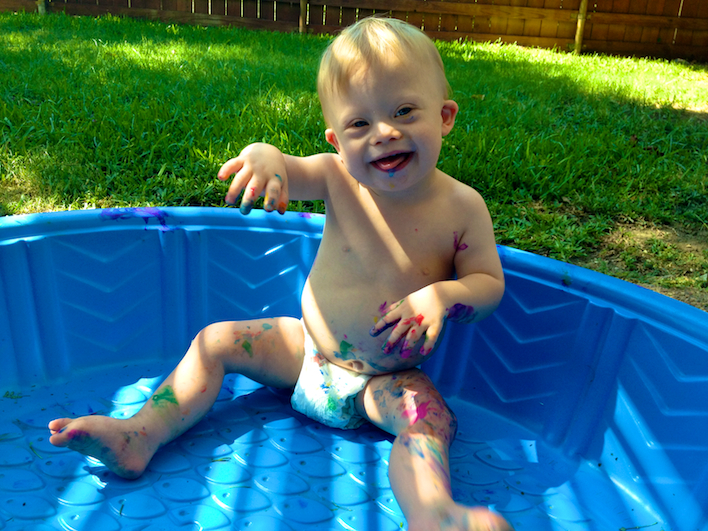 There are several great programs and people we have already been exposed to that express themselves artistically while also happening to have Down syndrome. For example, recently I was encouraged by the fact that Will and Kate are putting the artwork of Tazia Fawley up in Prince George’s room. I was impressed by Tazia’s steady hand and brilliant use of colors. I want to encourage that behavior in Noah at a young age. I was far from talented at art, but what child doesn’t love creating something on their own? I remember being so proud to show my parents my art work, to have my mom use a pot holder that I had woven together, or to play the piano with them listening. 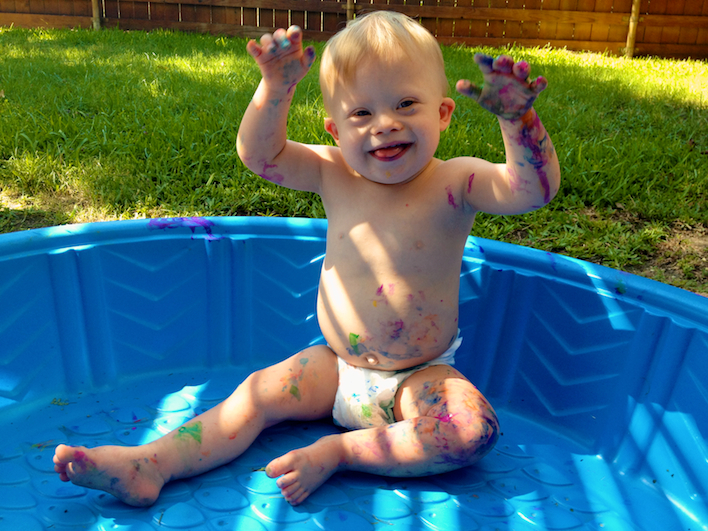 I know you’re probably wondering how I’m going to get over the mess based on my issues with self-feeding, but I came up with a brilliant idea of letting Noah fingerprint this in his plastic swimming pool! It was a short adventure but I think Noah liked it. The biggest challenge was getting Noah to keep the paint out of his mouth! We were using non toxic paint, however Pinterest has some recipes for finger paints that are ok to eat which may be a better option. 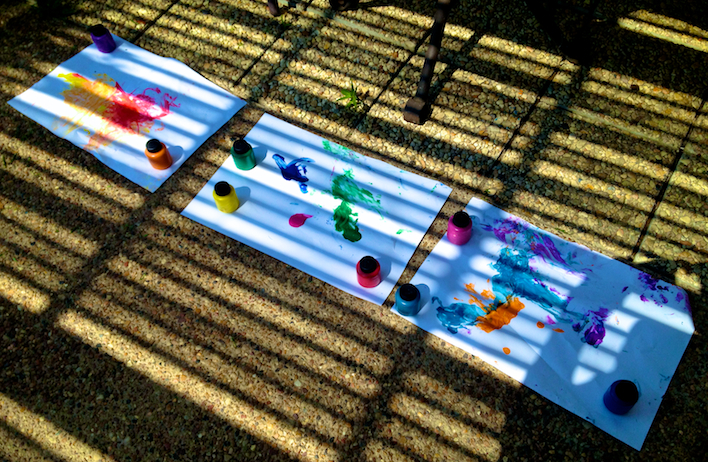 I simply put globs of paint on the paper and encouraged Noah to get his hands dirty, or maybe I should say colorful. Noah’s art is proudly displayed in our playroom today. I think this was as encouraging to me as it was for him. Hopefully this is just the first of his artistic adventures. 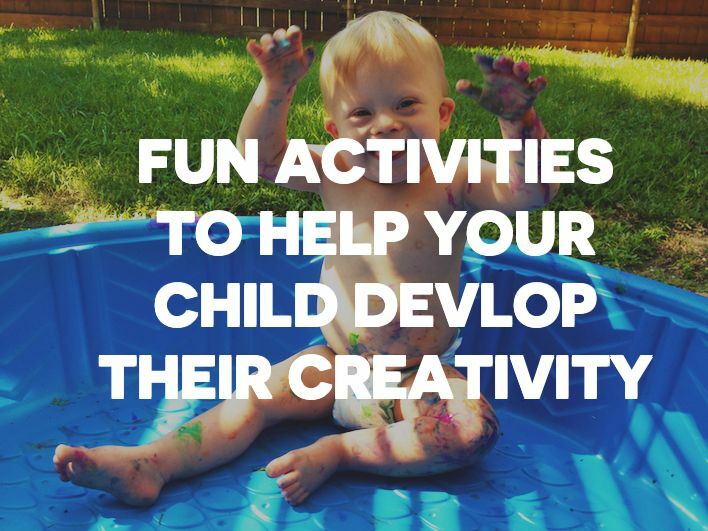 I was inspired to look at other great ways to cultivate creativity and came up with these ideas as well as awesome products to help our little ones create and develop their creativity at the same time! I’m absolutely fascinated by this book by Usborne titled My Very First Art Book. It provides you with an example of someone’s art work like Rembrandt or Edgar Degas followed by an activity inspired by that style. It shows you how to use various techniques such as ripped paper, splattering paint, collage, prints, dots, to simply using a brush to create works of art similar to the artist featured. I never know where to begin when I sit down with crayons and a blank piece of paper myself and this is an excellent idea starter for both you and your child. Painting is an excellent way to let your child explore creativity while getting the bonus of working on fine motor skills. Starting with finger painting and moving up to a brush. We used Crayola Finger Paints and Melissa and Doug Finger Paint Paper Pad to create Noah’s masterpieces and they worked really well. 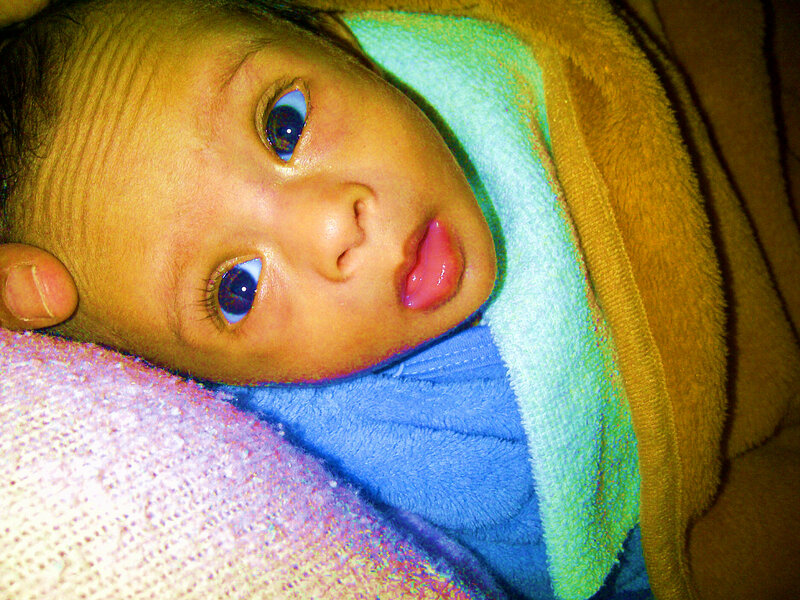 The colors were bright and he was surprisingly easy to clean afterwards. When looking for brushes, I found Melissa and Doug Jumbo Paint Brushes which seem to be the perfect size for Noah’s hands to help him grip. What painter doesn’t need an easel. I personally like Ikea’s easel as it is very cheap, but the Artist Easel by KidKraft looks awesome as well. And don’t forget the spill proof paint cups. If you follow our Facebook page you realize my husband enjoys building with Legos. This too is a great way to broaden the imagination especially if you create something different than the picture on the box. Pinterest also had a great idea of creating your own lego puzzle book to challenge your kids. I thought that would be a great idea to help Noah learn patterns and colors. We have started with the Duplo blocks which he (and my husband) love. I found a really cool kit that helps you make your own sock puppet. Thanks to the laundry monster we have a lot of single socks in our drawers and I know that Noah would not only like making them but seeing them come to life. Rick is an excellent story teller and is able to come up with amazing adventures on the spur of the moment. These socks don’t know what they are in for. Based on the fact that chefs are predominately male I am not quite sure why kitchen sets are usually catered towards females. This didn’t stop us from getting the amazing KidKraft Espresso Kitchen that I am slightly jealous of since it is nicer than my own kitchen. Noah has just started creating his own masterpieces in his little kitchen and serving them to me. We’ve added things like cookies in the oven, a tea kettle on the stove, and Betty Crocker 43 piece Pots and Pan set has a good combination of food and supplies. I hope to continue this in the future by bringing Noah into my not so fancy kitchen and having him help out. Hopefully it will move beyond him just licking the bowl. Toys such as Fisher Price Little People Animal Sounds Farm or any of their Little People products encourage imaginative play. I love when Noah sets up his animals and places them in various positions around the farm. They often get a ride in the Kidoozie Tractor around the farm. There are several play sets that allow kids to create stories and activities themselves. As great as cause and effect toys are, there is something special about seeing your child making up their own activities based on their imagination. One of Noah’s favorite ways to get express his creativity is to rock out on some musical instruments. His favorite probably being the drum and the maracas. He has spent a little time on the keyboard too. B. Parum Pum Pum Drum comes with not only a drum but a variety of musical instruments your child may enjoy. I was a piano player myself and wouldn’t mind seeing if Noah could one day learn to read music and play an instrument of his choice. What things do you do at home to cultivate creativity? 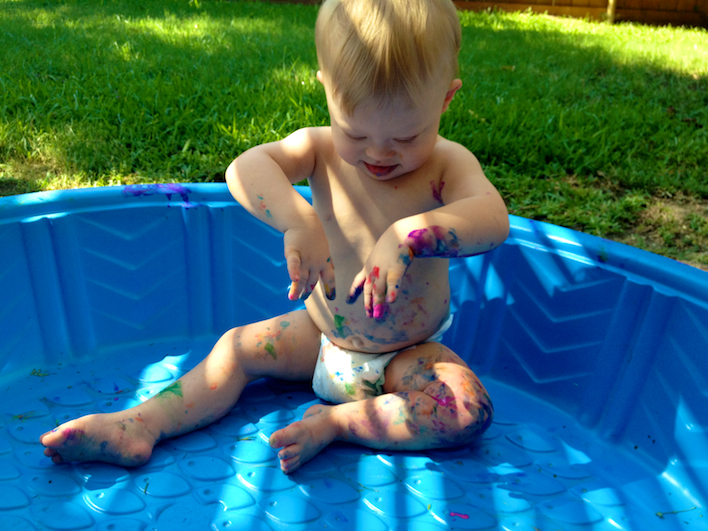 What is your child’s favorite creative activity? Do you children like to participate in any of the arts? How do you encourage their creativity? We’d love to hear some of your ideas, favorite websites for inspiration, photos, etc in the comments below! Your thinking is really quite extraordinary. The ways you have shown is really remarkable. I always find it difficult communicate with children. They cannot express, they do not able to talk properly etc. But after reading this beautiful blog, I think that there is huge opportunity if you can positively think about it. My almost 3 year old and 1 year old love painting in the bathtub! The pool is a great idea, but the bathtub is getting us through the winter. I mix 1/2 cup cornstarch with 2 cups boiling water and add food colouring. It tastes terrible, thus not encouraging them to continue to eat paint, but it won’t make them sick if they taste it. It is very easy to clean up too! I agree with everything you said about creativity. It is a real self-esteem boost for kids too when they make something beautiful or delicious. As you said, Pinterest is full of ideas. One of our other favourites is stringing beads on pipe-cleaners (my 3 year old can’t manage stringing them on string yet.) Also, besides finger painting, I have been giving her pom-poms to use for paint. It helps with fine motor control, and it is fun to make all those dots and smears.